Can you say, no photo shop for this image? Well it is true. This really happened. 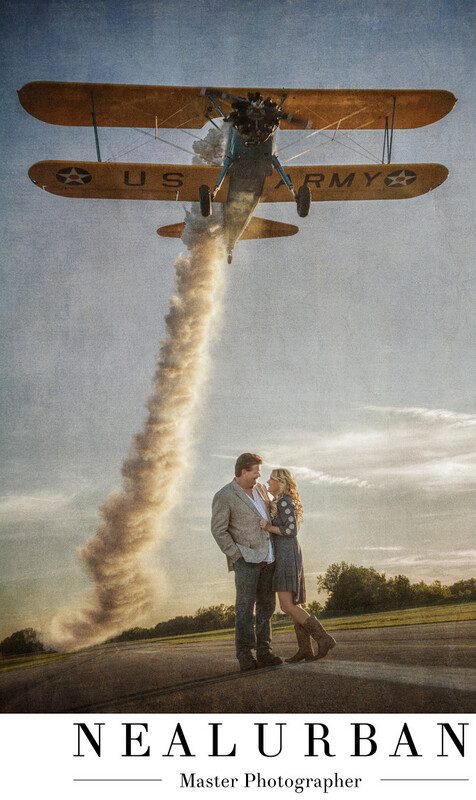 Amanda and Kevin wanted their engagement session at a small airport in Akron. Kevin used to be a commercial pilot. Then he began to inspect and fix small planes. Amanda worked at the airport and helped. How cool is that. This couple contacted us for their wedding that was held at Pearl Street Bar and Grill. In our meeting, they had so many ideas. Then they said they were interested in an engagement session too! They wanted it done at the Akron airport. I think at that point, Neal and I said this is amazing and heard nothing else. We would have full run of the airport. Wow! We went to the airport a few days before the scheduled shoot to scope out the area for ideas. We could not believe how much we could work with there. Kevin said he wanted to have his friend fly his glider plane and have sky divers jump out at some point. Could this get any better? Day of shoot, we brought on one of our assistants (his first actual shoot with us) to help. We needed all hands on deck and as many angles we could capture as possible. He got super spoiled on this engagement session. It was time for the plane to take flight. We talked with the pilot and said we needed him to fly right over the courageous couple on the runway. Neal had the spot he wanted to shoot from. He told our assistant where he wanted him to be. That left me standing with no place to go. I decided I was going directly in the center of the runway and going to lay down in the middle. When the plane flew over head, I thought I was going to pass out, I was so nervous. All I could think was to snap away with the camera. I knew in my mind the shot I wanted, but with a plane flying right over, wasn't so sure. Scrolling through the photos, I nailed the shot I wanted! My vision came to life and I told Neal, I got this! This image won a big award for me and Neal Urban Studio at the Wedding Portrait and Photographers International (WPPI) in Las Vegas. It was amazing and such an honor. And I love how this image has so much meaning to the couple! Location: John St Akron, NY 14001 Unites States.